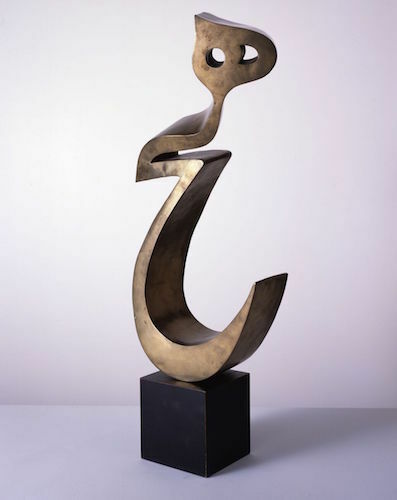 Parviz Tanavoli, Heech, 1972, bronze on wood base, 22 x 12 x 8''. Gumpert gives us sixty works by six artists, spanning three generations and two floors. Paintings and sculptures by older-generation artists Parviz Tanavoli and Faramarz Pilaram start off the exhibition. The gold and silver of Pilaram’s 1960s paintings have the richness of illuminated manuscripts through a geometric prism, yet adjacent installations from Barbad Golshiri and Chohreh Feyzdjou are dark, claustrophobic, and heavy. Golshiri deals with the markers of death, as evident in Memorial for Anonymous Martyrs, 2015, a leaning tombstone juxtaposing government text with poetry by Rumi and Nezami. Feyzdjou, who died of a genetic disorder in 1996, created 403 copies of a mystico-poetic book as an attempt to reach enlightenment (Série K [Series K], 1992). This darkness does give way to visual lightness—though not without razor-sharp bite—in works by younger artists Shiva Ahmadi and Shahpour Pouyan. Exploring the relics of conflict, Pouyan’s military-inspired works include the vibrant Unthinkable Thoughts, 2014, a series of ceramic domes from various religious buildings—a nod to the use of making ceramics as therapy to treat PTSD. Even for those familiar with Iranian art, there are new discoveries. Tanavoli, for example, better-known for his “Heech” sculptures, here has delightfully nuanced reworkings of old folio lithographs. There’s a lot to see, but this show encourages you to dig a little deeper—read the labels, look at the work, then read the labels again. Are these works “global”? “Local”? It matters not—they just, powerfully, are.